&A mediana edad sólo ha culminado con ¡la mitad del plan de Dios para usted!& ¡Todas las duras lecciones que ha aprendido a la mitad de su vida sirven de trampolín para completar sus sueños en la segunda mitad! ¿Es la &"mediana edad&" el final o comienzo de la mejor mitad de su vida? 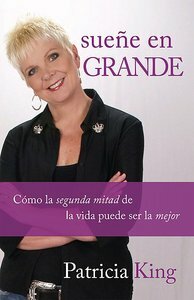 About "Suene En Grande (Dream Big)"
Patricia King is a prophet, teacher, preacher and internationally recognised author. She is also host of the weekly TV show Extreme Prophetic, a revolutionary concept in religious broadcasting. Her passion is to train, equip and inspire believers to witness miracles and wonders of Jesus Christ throughout the world. Her ministry provides resources at www.extremeprophetic.com.